This entry about walking on Islay I probably should have written a few weeks ago, but then again I wasn't ready. And in a way it is good because you now get two links for information about walking on Islay for the price of one. Good, isn't it? Only just over a month to go until this years Islay walking week. In February I wrote the Islay Walking Week 2009 Preview about WalkIslay 2009. Back then I promised a ‘more detailed review with more information and in particular pictures for each of the walks’. For a variety of reasons I never got around to write that, my apologies. Instead I've got something else now, which hopefully will compensate for that lapse: I've just finished the Islay Walking Week page for my Isle of Islay pages. It aims to provide a general overview about the walking week from a walkers perspective (i.e. me) and also provides an easy way to access all my WalkIslay travelogues. Not content with that I've also created an illustrated version of the WalkIslay 2009 programme. It contains pictures for almost all of the walks, hopefully helping to give an idea of what to expect. 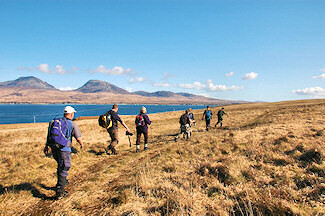 Karen Siddall has just launched Islay on Foot, guided walks on Islay and Jura. Karen is a qualified Walking Group Leader and holds a current First Aid certificate. She used to teach and has several years experience leading groups outdoors. I've known her for a number of years, mainly from walks on Islay and Jura we both participated in. She certainly knows the islands very well and I'm sure will be excellent guide. I hope this entry will encourage you to come walking on Islay, during WalkIslay 2009, with Karen or may be even both?